About 60 million years ago, after the era of the dinosaurs but long time before that era of men, the landscape of this region was different. There were forests and the rivers ran on a chalky soil. You can still see the limestone, chalk or white, east and west of the Causeway. Before that, the continents we know today were one and only land called Pangaea. 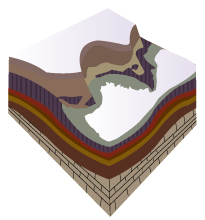 Continents are resting on massive foundations known as plates. These plates are moving slowly, causing the separation of continents. Europe and North America were separated allowing the formation of the Atlantic Ocean. 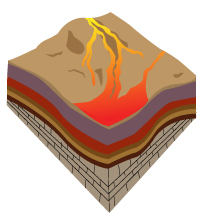 It’s at that time that hot magma ascended through the deep cracks of the earth crust. The magma spilled on the limestone ground, burning forests and filling the river valleys. The Lava from the Causeway cooled down, contracted, then burst to form sort of high columns. Most columns have five or six sides, however, others have four, seven or eight. It seems that there is one with three sides. If you want to find it, I wish you good luck! 65 million years ago, the slightly undulating landscape covered by vegetation was based on a bed of limestone. 60 million years ago, terrestrial plates began to diverge. The lava burst through fissures, cooled and formed layers of basalt rock. 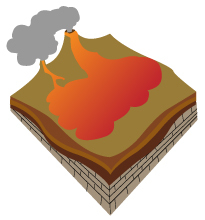 There was no volcanic eruption for about 2 million years. The hot and humid climate of the era broke rocks and formed a dark red soil. Then the cracks re-opened and let the lava escape again. Some of this lava spread in river valleys where it cools very slowly, shrinking and cracking to form regular shapes. The columns of the Causeway were born. About 15,000 years ago, towards the end of the last ice age, we finally discovered the outlines of the coast and the Causeway. The locals probably knew the existence of the Causeway a long time before she attracts the attention of the world. Their intimate and accurate knowledge of this place is reflected in the name of some places and we can see it their affection for this site in stories and poetry. In 1692, a bishop of the nearby city of Derry and one from Cambridge University visited the site. 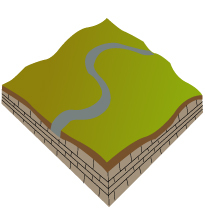 In 1693, the first known description of the Causeway was published in an academic journal and it is a direct result of the discovery they made at the time. The former sketches of these strange stones were fanciful and inaccurate. In 1739, a Dubliner artist Susanna Drury, painted magnificent views of the Causeway. A writer named the Vicar reproduced and distributed them everywhere. Therefore, people flocked from the whole of Europe to visit the Giant's Causeway. 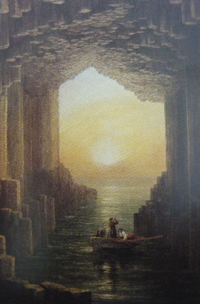 In 1772, the explorer and naturalist Sir Joseph Bank discovered the basalt columns of Fingal's Cave in Scotland, the other end of the Causeway. Because of the increasing number of visitors who comes to the Giant Causeway, people who possessed a gift of speech and the shrewdness became guides. The fishermen put their boats available to the public for visits on the sea around the Causeway. The Giant Causeway has seen lot of famous people; Sir Walter Scott came in 1817, Samuel Celemens in 1882 et more recently, Charles de Gaulle, Charles, Prince of Wales (1996). Richard Branson failed to land there. During his attempt to cross the Atlantic, his balloon plunged to the stones of the Causeway the 3 of July 1987 before landing in the west of Rathlin Island. The following year he visited the Giants Causeway in a more conventional way. In October 1842, after visiting the Giant Causeway on a boat, on rough sea, the Victorian writer William Thacheray gaped at the volcanic landscape and described it later as “the ruins of chaos”. For almost 400 years, treasures contained by the wreck of the Spanish Galleons, the Girona, remained buried in the seabed near the Causeway. A team of divers, led by Belgian archaeologist Robert Stenuit, discovered the wrecks position in 1967. During the excavations between 1968 and 1969, the team made poignant discoveries like personal items and jewelry that belonged to some of the 1,300 sailors and nobles who were aboard. Only five of them survived to the tragedy.